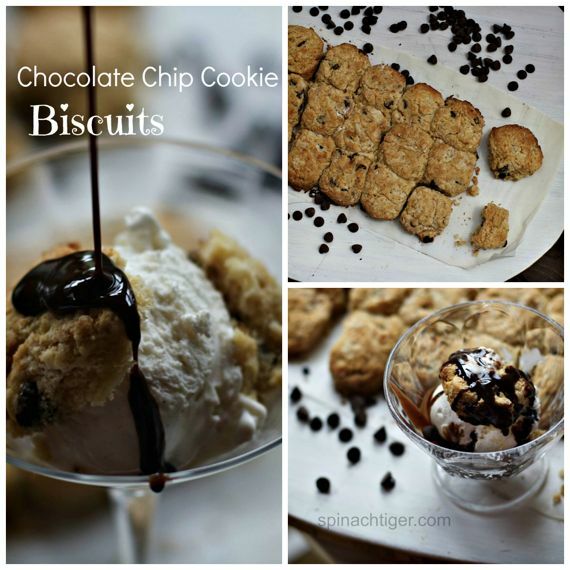 Biscuit IS the new cupcake and I can prove it with this chocolate chip cookie dough biscuit. Or I could say, brownie hot fudge sundae, move over, there’s a new girl in town and she packs everything into a dessert that everyone loves. Soft warm chocolate chip biscuits that smell like the cookie, ice cream, and warm dripping chocolate. The way my husband and his family and many others around here talk about biscuits, it’s if they are a thing of the past. I wish I had a dollar for every time I’ve heard that no one can make biscuits the way (fill in the blank) could, and that person is always dead, taking her secrets to the grave with her. Folks will reminisce about how they watched their mother or grandmother throw flour and fat into a bowl without a recipe, as mysterious as someone concocting a spell. They’ll never be another biscuit like Meemaw’s, and because those biscuits made on that woodburning stove were so legendary, no one dare attempt to make them. The lore surrounding those biscuits made this generation believe they just couldn’t be recreated. I broke into biscuit making and through much trial and error ended up with my fluffy buttermilk biscuit, which now serves as a base for many different types of biscuits, and we are creating our own family biscuit memories. Not everyone has a childhood memory of biscuits, but most can recall chocolate chip cookies baking in the oven. This is the bird that kills two stones, bringing those same smells and tastes of chocolate chips with brown sugar and butter into a biscuit. It’s two classics in one, and brings a double smile. This is a just a fun take off of the biscuit I am so proud of. I know this is unique and some Southern grandmothers may point a finger at me for stepping out of line and call me a Yankee, but Nashville is doing all kinds of things to Southern Food, creating a near food revolution here, so at least I’m in good company. Today is Mother’s Day. I give you the chocolate chip cookie dough biscuit to honor all the mothers and grandmothers of past and present who have pulled a tray of chocolate chip cookies or biscuits out of the oven for their family. Now just make sure to teach your children how to bake, no matter if they are boy or girl, so they can in turn do the same thing for their family. You can start with the chocolate chip cookie dough biscuit, which honestly was made by a five year old boy. If you’ve been around for any time at all here, you’ll know I have two sous chefs who love to be in the kitchen. Cut butter in until in small pea size pieces. Add buttermilk. Mix with spoon. Knead about 8 times. Roll out. Bake touching for 15 minutes or until golden. Mix ingredients. Melt on medium low heat, never stirring until chocolate is melted. Cut biscuits in half. Fill with ice cream. Pour chocolate sauce over. Serve immediatley. Angela, just catching up on all my favorite blogging friends after two weeks hiatus to The Netherlands. These biscuits look divine. 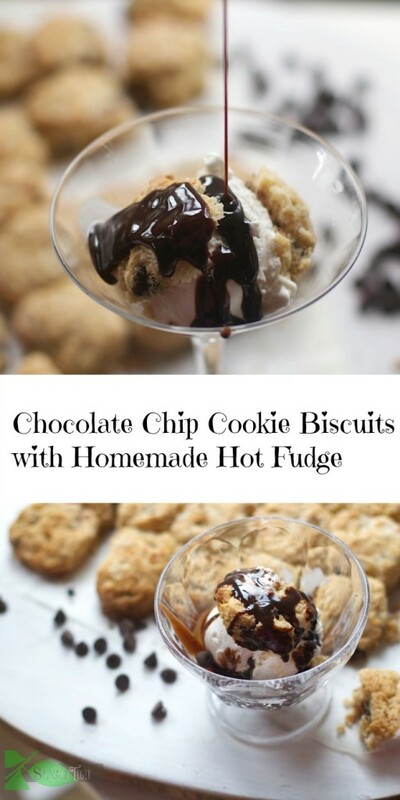 Great idea melding a dessert and a biscuit to have a really unique but accessible dish that doesn’t take forever to prepare. I will try this for sure. 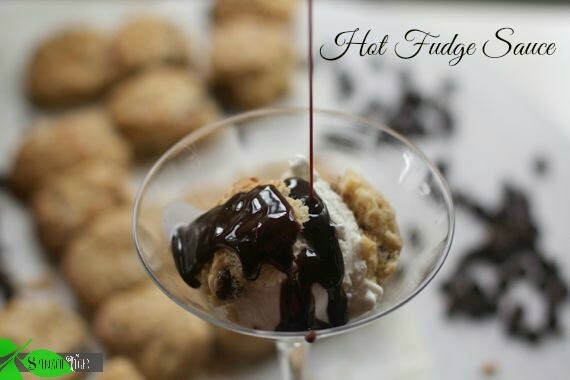 Oh my, I love the idea of chocolate chip biscuits in an ice cream sundae! I love this idea! I’m game for anything with chocolate chips! What a great twist on an original idea Angela! the biscuits look divine! Who knew the biscuit was so versatile. Maybe I’m creating a whole new trend!